Joy Creek Photo Archive (c) all rights reserved Rosa 'Lucetta' (Austin, 1983) was chosen as one of the best shrub roses in recent trials at the Chicago Botanic Garden. The dark green foliage has good substance and is free of disease. The flowers are large, flat, semi-double and pleasantly fragrant. 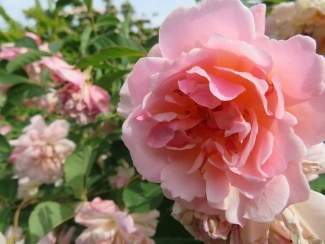 This is a rose that thrives with little extra care. Summer. 5 ft. x 5 ft.